How To Build a Bulletin Board | KaBOOM! A community bulletin board allows the community a space to post information about the playspace, upcoming community events, photographs from recent events, sign up sheets, messages, etc that will be visible to a large group of viewers. It can serve add to the community feel of the playspace by providing relevant and fun information that can be changed as frequently as necessary or desired. In addition, the board will keep the information dry and can add to the beautification of a playspace. 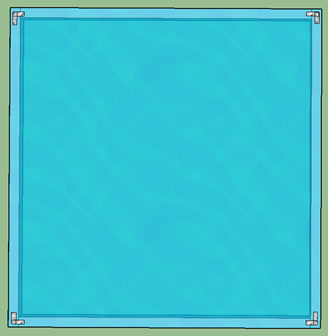 Set aside the 1x10x8' board. Do not cut. Set aside  2x4x8' boards. Do not cut. Take  2x4x8' board. Cut into  29" pieces. Take the last 2x4x8' board. Cut into  9 ½" pieces. Take  of the 2x2x8' boards. Cut each into  36" pieces, for a total of  2x2x36" pieces. Take the remaining  2x2x8' boards. Cut each into  44" pieces, for a total of  2x2x44" pieces. Take the plywood board. Using the chalk line and circular/jig saw, measure and cut down to a 3'x8' piece of plywood. Take the Plexiglas piece. Measure out  36"x47" pieces. In order to make cutting with the circular saw or jig saw easier, place a strip of painter's tape along the measurement on both sides of the Plexiglas, and cut through the painter's tape to make the cut edge smooth and keep the saw blade from jumping or snagging. Take the  4x4x10' boards. 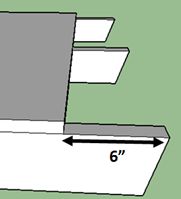 Set the miter saw to a 20° angle and cut an angle on one end of each post, as shown. Using the 3" deck screws, attach the plywood to the 3 angled 4x4x10 posts. 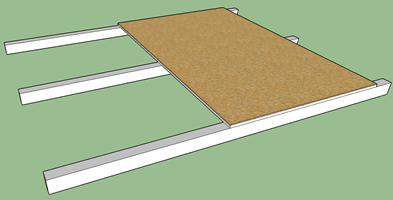 The top of the plywood should be 6" from the top of the 4x4x10s and the angled side should be on the opposite side of the plywood. 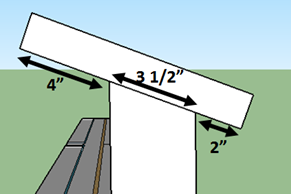 The 2 outside posts should be flush with the edges of the plywood and the middle post should be centered at 4' on the plywood. Using the utility knife, speed square, and yardstick, cut the cork to fully cover the plywood (edge to edge)- this should be 3'x8'. Then use the glue to attach the cork to the plywood. Using the 3" screws, attach one 2x4x8 to the plywood so its top edge is flush with the top of the plywood. 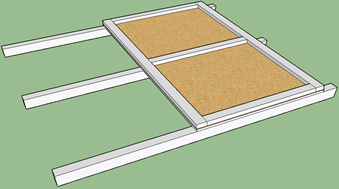 Attach the second 2x4x8 to the plywood so its bottom edge is flush with the bottom of the plywood. Then attach the three 2x4x29" pieces. 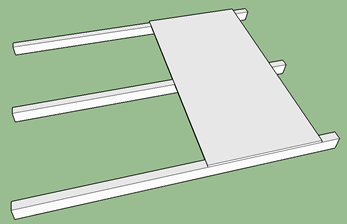 Two should be on each end of the plywood so their outside edges are flush with the outside edges of the plywood. The final 2x4x29" should be centered in the middle of the plywood at 4ft. Be sure the center of the 2x4 is centered at 4'- in the middle of the plywood. Next, begin assembling the doors. Take two of the 2x2x36" piecesand two of the 2x2x44" pieces, and make a square. 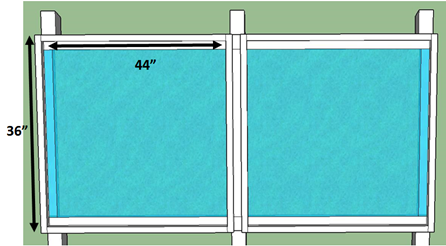 Be sure the 2x2x44s are set inside the 2x2x36s (see image). Use the ⅛" drill bit to pilot holes through the 2x2x36s into the 2x2x44s- this will help prevent splitting. Then attach using the 3" screws. Repeat this step, so you have 2 doors. 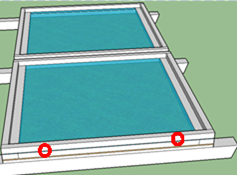 Lay the Plexiglas on the frame so it is flush on all sides with the outside edges of the 2x2s. Place a corner iron in each of the four corners. Using the ⅛" drill bit, drill pilot holes through the Plexiglas into the 2x2 but DO NOT drill all the way through the 2x2. 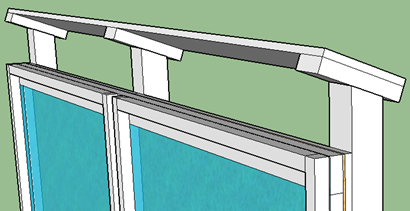 Then attach the corner irons and Plexiglas to the 2x2s through the piloted holes with the 1 ⅝" screws. Repeat this step so you have 2 doors with Plexiglas. Lay both doors on the bulletin board so that 2x2 side is on top - not the corner iron side. 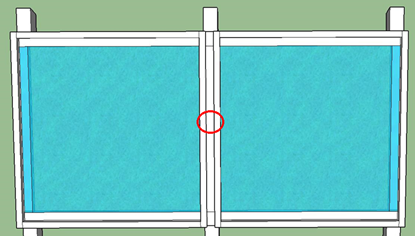 The outside edges of the door should be flush with the outside edges of the 2x4s - there should be about a 2" space between the doors in the middle. 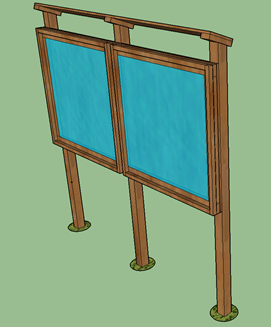 Attach the doors to the bulletin board using the hinges - 2 per door (see red circles on the image). 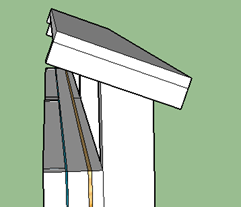 Attach the safety hasp onto the two doors in the middle. 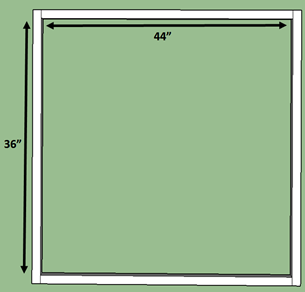 Prop the bulletin board up so that you can attach the 2x4x9 ½" pieces to the angled tops of the 4x4 posts. 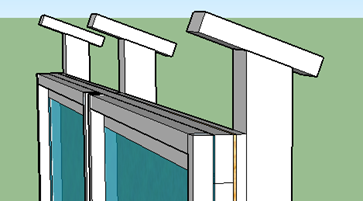 There should be a 2" overhang off the back and 4" overhang in the front. Use the 3" screws to connect. Attach the 1x10x8 onto the 2x4s so that it is flush on the ends and along the sides with the 2x4s. Attach using the 2" screws. 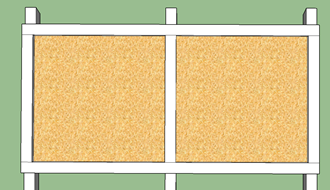 Use the constructed bulletin board as a template to mark the location of your 3 holes. Dig the holes about 10" in diameter and 2' deep. Once the holes are dug, put the bulletin board in the holes and check to make sure it's level both side-to-side and front-to-back. Once the bulletin board is level and plumb, concrete it in place, with 2 bags of concrete per hole. Leave about 3" between the top of the concrete and ground level, then fill the remaining 3 inches with dirt to cover the concrete.